A Fortune 500 organization and commonly known as one of the top 10 banks in US, Capital One is one the most prestigious banks you can choose to work for. In the following guide, we will take a look at some of the most coveted Capital One careers & their income, employee benefits, hiring process as well as the Capital One application process. Higher level Capital One careers will require college degrees and/or professional experience in that particular domain. Capital One internships are also available for students in a variety of domanins, including audit, finance, design and data analysis. Most Capital One job positions have a full-time schedule, but some branches may also offer part-time employment. 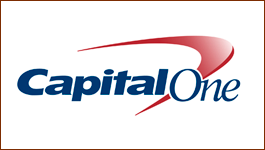 Candidates can search Capital One job openings on the dedicated Capital One careers portal, www.capitalonecareers.com. On this portal you can find specific information about Capial One careers, including job description and requirements. 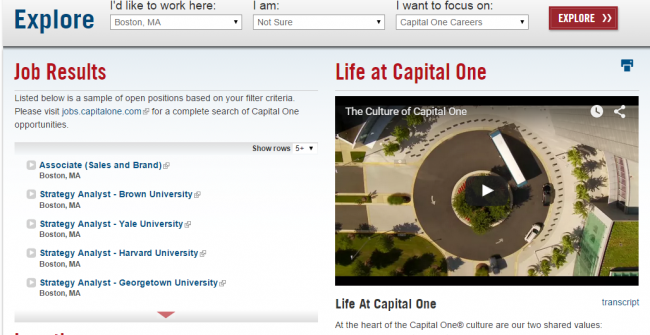 You can narrow down your search using the job filters on the right of the www.capitalonecareers.com landing page. Once you have a job opening you are interested in, you can begin the Capital One job application process. 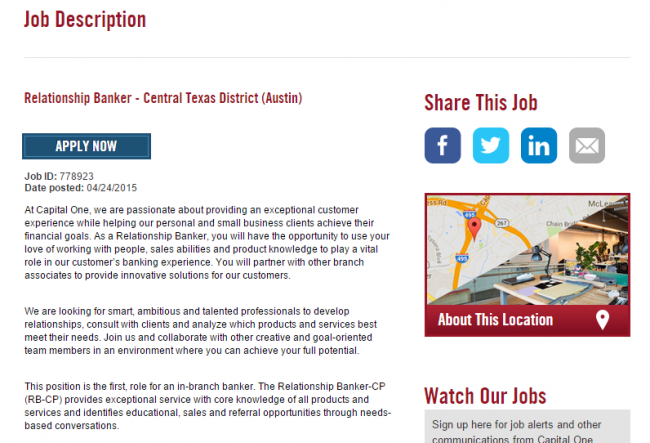 Capital One Careers Page – Overview of Available positions. To apply for a job, click the Apply Now button at the top of the page. 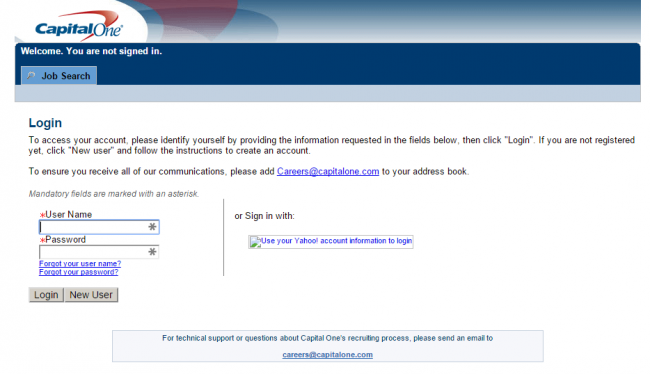 If this is the first time your are using the Capital One careers portal, you will have to create a personal account. You can also save a particular position, for further reference. 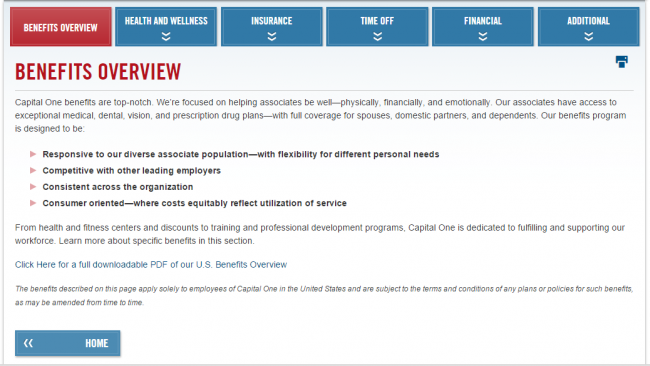 You can view saved jobs in your personal account on the Capital One careers portal. Click on the desired position and read its requirements and responsibilities. Click on the “Apply Now” button. You will be redirected to a third-party service that handles all the company’s applications. Create an account in order to begin the Capital One Application process. When you discover a job that suits your passions and set of abilities, complete the program by simply clicking the “Apply Now” button. You can save the job query and send the application later by clicking the “Add to job cart” button. You can also send the job through e-mail to a friend or search similar positions by clicking the hyperlinks located at the bottom of the site. When you click on „Apply to the job” button at the end of the job information web page, you will be asked to evaluate the electronic disclosure contract. After you check the confirmation box once you have analyzed the contractual terms, you will have to send your resume and other online information. If you are asked to do it, complete the online evaluation as soon as possible. However, if you do not discover an immediate position suited for your abilities, you are still motivated to build your information in the personal profile. You can create a saved search in order to get e-mail notices when positions that match your requirements become available. Look for current positions by classification, location, and search phrases. When you get the results, select the “Save this Search” box at the top area on the right. You can opt to get e-mail notices that match the requirements in the saved searches. If your professional background, abilities and passions are suited for a current position, an employer will contact you for a first phone examination. These phone screenings usually last for 20 or 30 minutes and permit the HR manager to gain information about your qualifications and skills. It is also a chance of you to explore the company. The employer also considers whether work objectives are coordinated with the position or maybe with a different job. If you are looking for a job with particular technological abilities, you could also be contacted for a technological examination. You can go through a sequence of assessments, starting with simple Internet assessments that can be taken from the convenience of your desktop computer or wherever there is an Internet connection and a good place to concentrate. Solving problems is the goal of collector jobs. Reducing client misbehavior is the most important operation in these Capital One careers, while calling non-complying clients, organizing payments and working with providers to ensure the place and reception of various collaterals also are necessary responsibilities. Applicants must demonstrate abilities in discussing, utilizing skip searching tools to locate clients and using line management techniques to perform on an allocated group of accounts. Those who submit a Capital One application need to possess at least a high school degree and more than one year of experience or call center background. 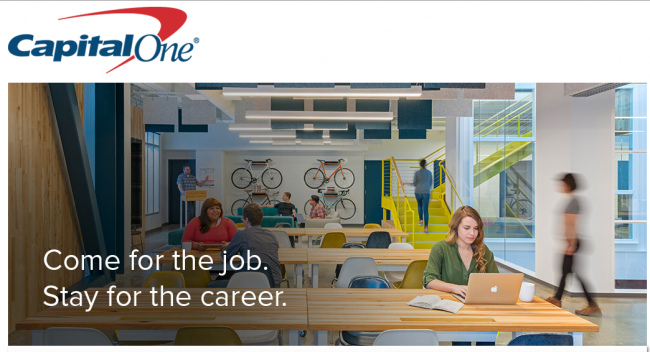 These Capital One careers are paid from $12.00 to $13.00 per hour. The working hours are traditional, between 9 and 5. However, seeing as this is a financial institution job, you might be asked to put in some extra hours. Being the interface of retail division functions, tellers have an important role in client financial operations. They perform various operations each day, such as cashing assessments, depositing assets, money shifting and receiving payments from bank clients. Almost 50% of the job implies working with clients, while other obligations consist in maintaining a balanced cash storage, determining sales possibilities and doing regulating procedures. Employees must be able to describe products and recommend different choices to clients in addition to solving problems with appropriate and precise etiquette. Credentials consist of a secondary school degree and at least 6 years of experience. Workers can have a Capital One salary from $9.00 to $14.00 per hour. Yearly wage options go up to around $40,000 or $50,000 per year for very qualified workers. The working schedule is from 9 to 5 or 10 to 6. High-energy candidates capable of performing well in groups & with social skills, qualify ideally for such Capital One careers. Obligations can include offering support to existing clients, doing account-level researches, suggesting various items & packages to clients, attending team conferences, upgrading account data, examining certification and maintaining information about changes, improvements and advancements of all systems, items and novelties. Solid attention to details, written and spoken abilities and interest for client support suit candidates well. Potential candidates must have at least a high school degree and at least two years of client support background, while people with one year of experience in call centers also enjoy preferential treatment for their Capital One application. Customer Support Managers often get Capital One salaries from $12.00 to $13.00 per hour. Dress appropriately, wearing a business or corporate suit. Trim yourself, including your head and facial hair. Practice answering to questions under a certain time pressure like some of these assessments are timed.